Keeping mosquitos away from humans is still the best disease prevention. 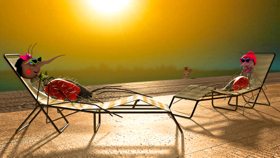 OTTAWA, Ontario - March 16, 2016 - PRLog -- Chocolate Moose Media's (CMM) 11 animated Zika-prevention public service announcements (PSA) are now available for free download on Youtube and on the Vimeo channel of company founder Fiirdaus Kharas, who hopes the videos will become widely used in areas that are threatened by the disease. Kharas made use of some templates from his award-winning Buzz & Bite series (malaria prevention) to get the Zika messages out as quickly as possible. The advice is very traditional: if you keep mosquitos away from humans, you control mosquito-borne diseases. "We must develop a capacity to respond quickly in a health crisis with accurate and effective behavior change communications. Lives can be saved," he says. Zika has no cure and is difficult to identify. There is also a large amount of conflicting information about its causes and effects. CMM's Zika PSAs provide information in a humorous way that can help those in endemic cities and villages understand the basics of transmission and how to avoid various myths that emerge whenever an epidemic happens. The video messages include eliminating standing water where mosquitos breed, using insect repellent and bed nets to keep mosquitos away from human skin and squashing the false ideas that the disease is a result of genetically modified mosquitoes or transmitted by vaccines, fruit or spirits. The videos are available at - https://vimeo.com/firdauskharas - and are only in English. CMM is looking for funding to have them translated into French, Spanish and Brazilian Portuguese. Chocolate Moose Media - http://www.chocmoose.com - is the world's leading producer of animated behaviour-change communications aimed at solving health and social issues around the world. It produces film and animated television with offices in Geneva, Switzerland, and Ottawa, Canada. Founder Firdaus Kharas uses proceeds from for-profit projects to fund not-for-profit campaigns.